What’s Up With … Battle of the Sexes? The idea of men vs. women never fails to capture the imagination of the public and yet equally always seems to fail to capture the imagination when they happen. The result of mostly the same. The man beats the woman unless of course the man is twice the age of the woman or an amateur. One has to be careful not to sound sexist but the results do speak for themselves, it’s hard to find much value out of these supposed battles. I for one think it’s great to watch mixed doubles. That makes much more sense and doesn’t make a cabaret act out of it. You just have to look at the history of this competition to see what a farce it is. In almost every instant, the choice of contenders has been dubious. 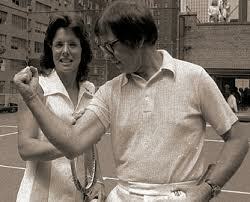 Bobby Riggs was the first to come up with the idea as a cash-in opportunity and although he ‘beat’ Margaret Court, he was schooled by Billie Jean King, who at the time was half his age. Mark Kermode reviews The Battle of the Sexes. A documentary charting events leading up to the infamous 1973 tennis match between retired men’s champion Bobby Riggs and female star of wimbledon Billie Jean King. 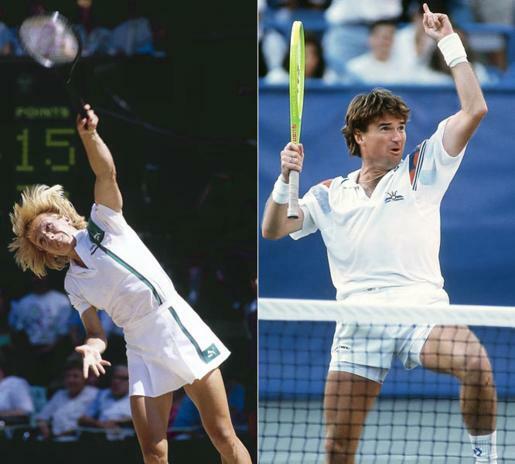 Martina Navratilova turned down offers to play against Nastase and McEnroe until she was goaded into playing Connors, who ever classy, had money on the match and called it a war. She would have had a better time playing Mac. Wacky Karsten Braasch, always up for some fun, played the Williams sisters each after they laid down a challenge they could beat any man ranked over 200. Braasch beat them both and is quoted as saying “500 and above, no chance” and going on to say, that he had played like someone ranked 600 in order to keep the game “fun.” That’s Braasch! Credit then, to Justine Henin who took Yannick Noah to a 3rd set tiebreak and suffering Noah playing in a bra for heaven’s sake! I wonder what Navratilova thought of that. The most recent foray into this sub-genre of tennis was Thomas Muster against Sybille Bammer. This time, although played in good spirits for charity, Muster still quietly beat her 2 and 3. What did we learn? It’s one thing watching Steffi Graf hit with her husband Andre Agassi (which is pretty special) or a charity mixed doubles match but when are these battle of the sexes events ever going to evolve? Am I off-base? Tell me what you think!